100% Superior Quality Heavy Weight Poly Knit Fabric Table Runners. Our Premium Runners Come Rolled on a Reusable Tube to Keep them Looking Great. All our Printed Table Runners are Made in The USA. Price includes full color imprint of your logo or custom artwork on the Table Runner. 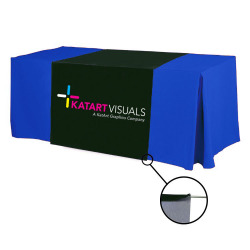 Table Runners are Printed with 4-Color process-dye sublimation imagery. Our printed Table Runners are suited for indoor or short-term outdoor use. Our printed table runners are machine washable and dryable. NO CHARGE RUSH Service is available for your table runner orders. Get your order of 6 pieces or less shipped as quickly as the next business day! Please email us or call us M-F 9:00-5:00 EST at 860-350-8016 to discuss. Our printed table runners start off white and are completely dye sublimated in full color. Very often the graphic is maximized and center on the lower 30" drop where the runner drapes in front of the table, however a logo can be printed on both ends, or the entire runner can be printed horizontally and used as a table banner.